Bored of the same-old waitresses handing out drinks at your party? The Champagne Lady is a FABULOUS new way to get drinks to your guests! Her dress is on wheels, so she can stroll around your party serving guests and looking great. Does the Champagne Lady move? Yes! The Champagne lady’s dress is on wheels, so she can stroll around your party serving guests. How many glasses does the dress hold? 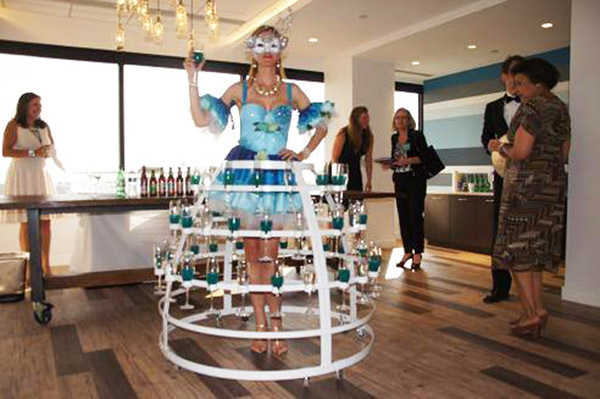 The Champagne lady’s dress can hold up to 60 standard champagne glasses. How big is the dress? The dress is 48 inches in diameter. The dress can be deconstructed into 2 pieces to fit through/in right spaces. What does the Champagne Lady wear? The performer’s wardrobe under the champagne holder ‘dress’ is picked specifically for your event. We can match any theme or color scheme. Do you have any other living tables? Yes! We have more living tables here. Want to give us a few more details? Songs that come to you. The face painter was AMAZING! We got so many compliments on him and his work. He is truly an artist. We will recommend him to everyone. We look forward to using him again next year.